Four members from the 2005 Little League World Series championship team are now students at Saint Louis School. 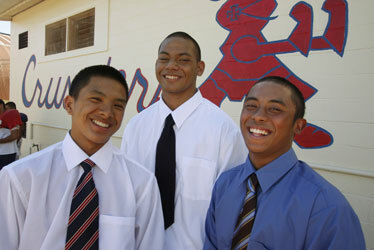 Layson "Kaeo" Aliviado, left, Vonn Fe'ao and Sheyne Baniaga pose in their school clothes before changing into football uniforms for practice. Classmate and teammate Myron "Kini" Enos was unavailable for the photograph. As Waipio's Little League players advance at the national championships in Pennsylvania, the 2005 world champs from West Oahu are among the many cheering them on. Waipio Little League will play Lake Charles, La., tomorrow for the national title. If Waipio wins, the team will compete to become world champion on Sunday. "Watching them brings back memories," said Sheyne Baniaga, a former member of the West Oahu team. "My adrenaline was pumping." The former World Little League champions from West Oahu hope the Waipio team will follow in their footsteps this year. Catching up with 2005 world series champs. The West Oahu 2005 champions will be among the Waipio team's biggest fans in tomorrow's U.S. championship game and hopefully in Sunday's world championship. "I hope they do (make it) so at least we can cheer for them," said Layton Aliviado, the coach of the West Oahu team that gathers at player Ty Tirpak's house to watch the championship game every year. Waipio is scheduled to play Lake Charles, La., tomorrow for the national championship. The world title game is Sunday. Friends and family of the Waipio Little League team can gather tomorrow at the Mililani Golf Course Restaurant, 95-176 Kuahelani Ave. The gathering is open to the public, but there will be seating reserved for family members of the team. For more information, call the restaurant at 625-2256. The former West Oahu team members are now in high school, many in private schools, with several playing other sports - and, of course, baseball. Michael Memea, who hit the game-winning home run in the final 2005 game, was practicing with the varsity Damien Memorial High School football team yesterday. 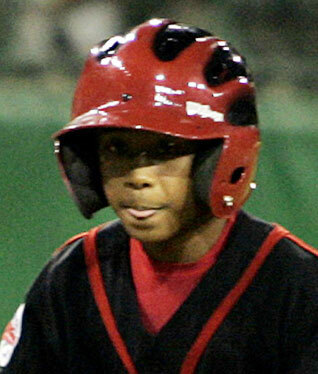 After practice he picked up a bat and hit some balls in the cage with his father, Mack Memea. Memea is practicing for the Arizona Fall Classic Baseball Combine, where he hopes to get exposure in front of pro scouts and college coaches. Memea, 15, hopes to play baseball in college and go on to become a police officer or firefighter. His father remembers the championship experience fondly. "That was amazing," he said. "To go to Williamsport and actually step on the ground and just feel the aura there. You feel like a kid. You're proud." 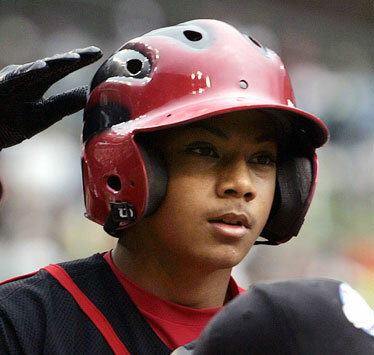 Layson Aliviado congratulates a teammate on his way up to the plate during the West Oahu victory over Willemstad, Curacao, to claim the 2005 Little League World Series championship. Another team member, Vonn Fe'ao, who shut down the opposing team with his pitching, suited up for practice with the Saint Louis varsity football team yesterday. The soft-spoken junior said winning that game in 2005 made a "big change" in his life. "I got to come to Saint Louis," he said. "I'm just trying to take it all in." 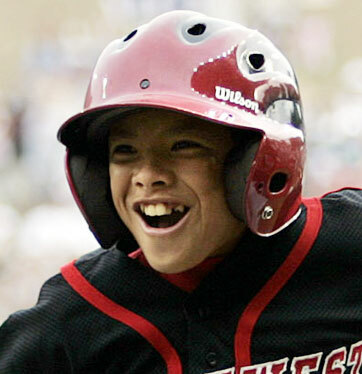 Vonn Fe'ao celebrates his fifth-inning, two-run home run against Vista, Calif., during the United States Championships of the Little League World Series in South Williamsport, Pa., in 2005. Fe'ao was offered a sponsorship by Saint Louis teachers to attend the school. "It's given me a lot of exposure. Hopefully that works out well," he said. He advised the Waipio team to "keep each other up and never give up." If they win, "they're going to be rock stars when they come back." Sheyne Baniaga rounded third base after hitting a two-run homer that proved decisive in West Oahu's 2-0 win over Lafayette, La., in the semifinal game. "Watching them brings back memories," said Sheyne Baniaga, another teammate on the West Oahu team, who is now playing varsity football for Saint Louis. "My adrenaline was pumping." The team does not play baseball together anymore, he said. Now they play for their schools. "We play against each other now. It's real competitive," he said. For Baniaga the win made him want to pursue playing baseball for a Division I team in college. 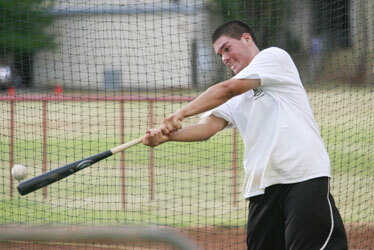 Former West Oahu baseball player Michael Memea took batting practice with his father, Mack Memea, yesterday after football practice at Damien Memorial High School. Michael Memea hit the game-winning homer that propelled West Oahu to the 2005 Little League World Series title, capturing the imagination of isle fans. He is preparing for a baseball tournament in October. "Keep working hard and appreciate what they have now because when they come back, they're going to miss it all," he said. "Playing in that field and the fans, you get treated like celebrities there." Aliviado, the coach of the West Oahu championship team, is returning to coach West Oahu again this year after a three-year stint coaching junior varsity at Saint Louis. 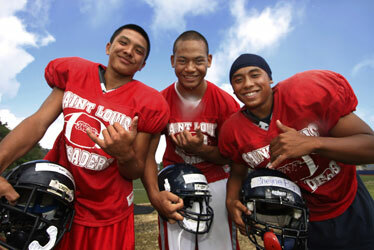 Layson Aliviado, left, Vonn Fe'ao and Sheyne Baniaga give a shaka before they start football practice for Saint Louis School. The three youths, who played key roles during West Oahu's run to the Little League World Series title in 2005, are playing close attention to Waipio's title hopes this year. "Cherish the moment," he said. "Win or lose, they're champs." "Sometimes I wish I was there," he said. "You cannot forget. 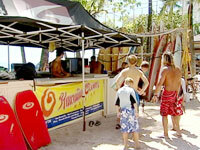 The people love Hawaii in the mainland. When they see Hawaii, they love the team. Sometimes you get chicken skin just seeing a Hawaii team go back and do what we did."